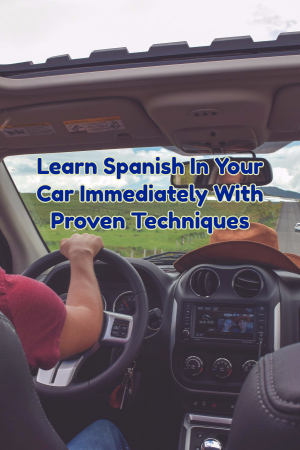 Learn spanish in your car and open up a whole new world at the same time. For whatever reason, I skipped taking Spanish in high school. Now, I regret it. It is such an important language to understand in everyday situations. I take Zumba classes where many of the instructors speak half the time in Spanish and half the time in English. That is what did it for me. I had to learn what they were saying so I could do a workout properly! That is when I found the easiest way to learn this language. I was able to pick up some phrases and words here and there but it wasn’t until I found that there are programs that let you learn different languages while you are commuting. I did this with a Spanish program and was soon breezing through all the basic vocabulary words and conversational phrases. I was able to understand a lot more during every Zumba class. I also now have an extra skill that is handy on the job. All I do is put the program in when I start driving and have been able to literally listen my way to a new language. There are pronunciation guides and several levels to start with. There are also words that focus on Internet usage and cell phone usage. I also feel like I am doing something good for my brain by learning a new language.